Liberty Bell’s Jadyn Mitchell elevated for a return in Monday’s home match against Omak. The Lady Lions lost, 3-0. 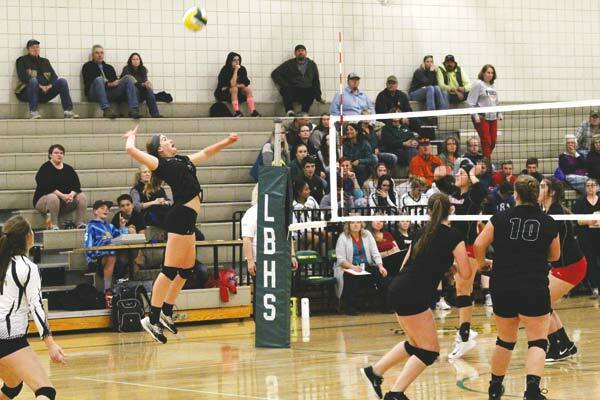 The Liberty Bell High School volleyball team pushed Omak to the limit in a home match on Monday (Oct. 22) before losing 3-0. The Lady Lions got off to an uneven start against the 1A Pioneers, dropping the first game 25-14. In the second game, Liberty Bell seemed headed for a similar outcome, falling behind early. They trailed 20-16 before making a late run, and even took a brief lead at 23-22. The teams traded points to reach a 25-25 tie and, under the win-by-two rule, kept going. But the Pioneers scored the final two points for a 27-25 win to go up 2-0. The Lady Lions needed a win to extend play, and they almost got it. This time it was Liberty Bell that surrendered an early lead that they built to a 16-9 margin. That’s when Omak started gaining ground, but the Lady Lions still had a 22-19 lead late in the game, and reached match point at 24-22 — and couldn’t quite do it. The teams played a long, tension-filled point that Omak won to tie the game at 24. Liberty Bell got to 25 first but still needed two points to win. However, Omak scored the next three points for another 27-25 win and a 3-0 victory in the match. Coupled with a 3-1 loss on the road last week to Soap Lake, the Omak outcome left the Lady Lions with an 8-6 record for the season, 3-4 in league play. Liberty Bell ended regular-season play with a home match against Bridgeport on Tuesday (Oct. 23). The Lady Lions defeated the Fillies earlier in the season, 3-1.